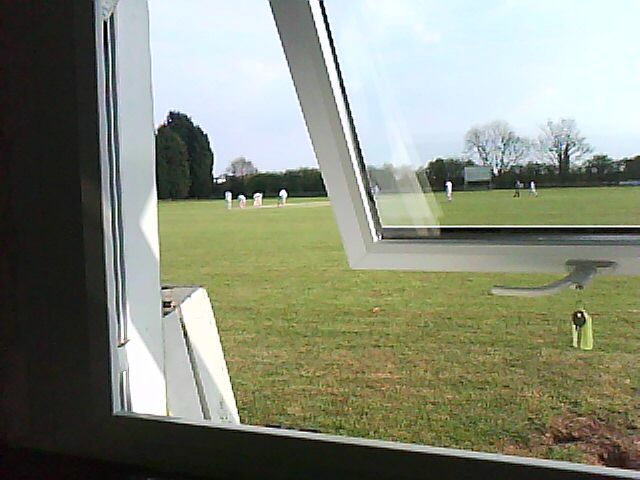 The ground at Frenchay was bathed in warm spring sunshine and beneath the winter cobwebs the pitch appeared to be bone dry. The toss was dispensed with; presumably in these cash-strapped times nobody had a spare coin, besides, skipper Ev had amicably negotiated the terms of engagement with the opposition and everyone seemed happy for the Cowboys to take to the field. Earlier, there had been murmurs that the Cowboys only had ten men and yet the field looked well populated and the ball always seemed to find a fielder. Remarkably shrewd captaincy, perhaps? Winter net sessions appeared to have paid off as the bowlers all settled in to a tidy line and length, restricting Frenchay to less than three an over, even if the batsmen initially proved difficult to dislodge. A brilliant spell of bowling by Wayne should have been rewarded earlier when the batsman was duped into offering a tame lob over the bowler's head, only for mid-on to trot around and spill a dolly like a greased piglet. His blushes were spared when Rob dislodged the batsman a few balls later, on his way to a three wicket haul that earned him a joint man of the match award. Otherwise, the fielding was sharp; Ev clutching a smart caught and bowled, Wayne holding a screamer in the slips and Joe hurdling the boundary fence with more aplomb than most Aintree nags, even if the ball had already beaten him to it. New blood Alex acquitted himself well, picking up a wicket in his first match and Angelo tumbled nimbly behind the stumps after a speedy recovery from his broken ankle. 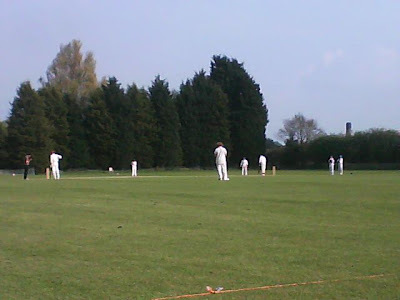 For most of the innings it didn't look like Frenchay would muster more than 150, but unbeknown to most, the skip had decided to donate a few runs to the opposition in the final few overs 'to give the Cowboys some batting practice' and consequently Frenchay ended up on 163 for 9. After tea, which comprised surely some of the whitest bread to ever leave an oven, the skip sat down to define the batting order, only to discover that there wasn't enough room on the scorecard. Somehow, the Cowboys had gone from thinking that they were one player short to having one extra and the once shrewd captain now appeared to be lacking some key skills. James valiantly extricated himself from the batting line up as Ev furtively rebooted his abacus, wondering if the opposition had noticed. The Frenchay opening attack was lively and direct. Much too soon Angelo and Ben were removing their pads with few runs on the board and once Grant had departed too, the Cowboys were in dire need of the steadying presence of Steve. The score trickled along until Ev missed a straight yorker, your correspondent only narrowly avoiding the same fate before the pace was replaced by spin and he eventually heaved when he shouldn't oughta. Joe joined Steve for a while, whose batting earned him the other man of the match joint, but a respectable total was still a long way off. Rich wagged the tail a little with a six over mid-off, but his failed attempt at a repeat two balls later saw the onset of mange. Rob, Wayne and Alex did all they could before the innings was humanely put to sleep, a little less than a hundred runs short of the target. At the end of the match, when Ev sheepishly informed the opposition captain that we'd accidentally fielded with twelve and the reply was, "Oh yeah, we knew," the winner of the Cider Moment was hardly in doubt.